DECEMBER 6, 2010 - Antelope Valley California doesn't boast the the kind of grit and glamour that one finds in Tinseltown, but it is home to a band with a big thunderous metal sound that brings back a memory or two of that old metal sound before it became 'nu'. 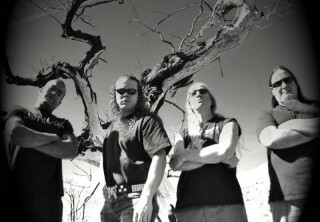 DISTORTED FATE was the brainchild of drummer BRIAN BANNER and guitarist BOB SPEARS (both former members of a band called FOREWARNED). Vocalist MIKE WEINBERG walked in on one of the jam sessions between drummer and guitarist and provided the growl that SPEARS's riffs and BANNER's drumming demanded. The bands search for a bass player proved fruitful with AARON CROSS who came from the IRON MAIDEN tribute band SEVENTH SON. 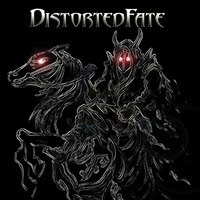 In the band's pursuit of big time success, they have teamed with producer MATT GRUBER (QUEENSRYCHE, SCORPIONS) which has resulted in the band's electrifying debut album HAUNTING - a 10-song catalog of reflections on anger and betrayal that proudly and loudly proclaim to the world that DISTORTED FATE has arrived. YOU CAN DOWNLOAD THIS EDiTiON OF ROCKWiRED RADiO HERE!! !